Day 127 / Hat 127: Taupe-colored 100% rabbit fur felt hat with braided horsehair hatband and satin lining, part of the new Theodore Roosevelt collection from Orvis and a birthday gift from my sister-in-law Kathleen. She surprised me with it yesterday on my whirlwind tour of Southern Vermont that had me, in the course of a half a day, drinking coffee on the porch of the Wayside with my sainted mother, tipping a Molson with my dad in SNAFU Hollow, breaking bread (and steak) with my broham Al and my OTHER sister-in-law and a goodly number of their brood (including his grandson), powering down a cup of coffee at Naughty Pine with Thleen and my mother-in-law, bolting across the mountains to stuff a four-day weekend into a one-day bag and then circling my wagons (such as they are) to depart toward Boston (at 2 a.m.) for a 7 a.m. flight to LA. While I still haven't slept, slapping this bad boy atop my head made me feel like grabbing the reins, shouting "Bully!" and charging on ahead. Take a moment to imagine what I must've looked like emerging from a dust cloud at sunrise on the outskirts of Bean Town, loaded for bear and making a bee line for Logan International Airport with this awesome lid gracing my bald and feverish pate. So a sincere tip o' the hat goes not only to my sister-in-law Kathleen, but to the legacy of Theodore Roosevelt himself. Oh, and in case you're wondering, the above photo is shot against the Giant Birds of Paradise in our backyard. While I felt truly at home every single place I went this weekend, I yearned for our little slice of paradise back here in the Golden State. 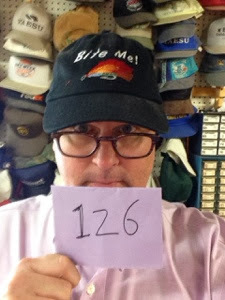 Day 126 / Hat 126: Black, cotton baseball-style cap with multicolor fly-fishing fly embroidery with the words "Bite Me!" In white embroidery. A loaner plucked from the shelves of the Wayside Country Store during a whirlwind pop-in over the reunion weekend. My dad's impressive rack of hats can be seen displayed (in the store) in the background. Day 125 / Hat 125: Plush bear hat courtesy of Mary Hepburn (fave high school faculty member/art teacher/potter/Amy's mom) with photobomb courtesy of Rob Bevier fellow Vermont Academy Class of '83 alumnus - at our 30th reunion homecoming barn party. Mary was kind enough to have three headgear choices to choose from lined up on the table upon my arrival (if there's a word that means "hat smorgasbord" I would be using it here). 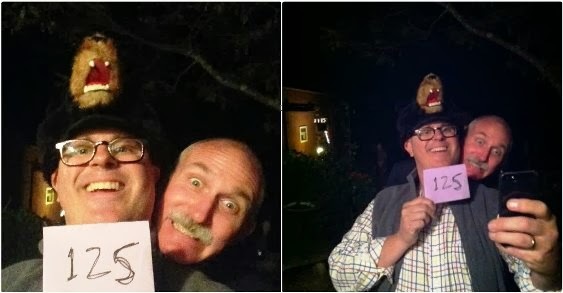 I hastily posted the original selfie with hat (at left) from the 30th-reunion shindig in Mary's backyard because my cellphone power was dwindling and midnight was rapidly approaching. But the photo at right, snapped by classmate Ami Lai (nee Schlirf) is truly awesome since it captures the photobomb as it dropped. There two tips o' the hat today - one to Mary for the hat, and one to Bevier and the rest of my classmates who indulge my hat-focused whimsy. Day 124 / Hat 124: White, baseball-style cap with orange, black-edged embroidery that reads: "Vermont Academy Alumni." It's reunion weekend at my old high school and these were being handed out at the registration desk. So today's tip o' the hat goes to my alma mater, Vermont Academy -- where I learned how to keep my head in the game. Day 123 / Hat 123: Weathered black, 100% cotton, baseball-style cap with gray embroidered mountain range detail above the words: "SANDGATE, The Biggest Little Town in VERMONT." There's also a green sticker on the underside of the bill that reads: "PLU Number 4649" which is a pretty good indication that this came from the Wayside Country Store. This was one of the hats from the Birthday Box series my sainted mother sent, and seemed the perfect hat for today's excursion. Since I've previously discussed my hometown, I thought I'd take this opportunity to tell you about SNAFU Hollow - which is family parlance for our neck of the woods - across the Terry Brook at the end of Lincoln Lane. But don't look for it on any map. The name is a military acronym for "Situation Normal All F***ed Up" and has long been used to describe the brain-bending, soul-stretching ebbs and flows, highs and lows and bouts of cosmic dissonance and alignment residents of said hollow have experienced there over the years. That bumpy road that leads into the hollow? It leads right out too. Day 122 / Hat 122: Charcoal gray, 100% wool roll-up trilby hat with leather band and metal rivet detail. This lid, from the brand-spanking-new Gap X GQ Best New Menswear Designers in America collection that hit stores just yesterday, is one of Bespoken's contributions. I bought this bad boy right off the store floor (well, technically it was on a table - that's just a figure of speech) at the Gap's Grove store last night during a special pre-shopping event for the collection. A wholly autumn-appropriate piece of headgear, and one with, dare I say it, just barely a dash of Bavarian bravado -- making it the perfect accessory for the Oktoberfest now under way. Interior tag reads: "100% Wool/Lana/Laine, Large/Grande," and interior of crown printed with the words: "Made in the USA - Packable - Water Repellent, Lite Felt, The Original." This bad boy came from the Orvis flagship store in Manchester, Vermont, you might even say I drove over and picked it up myself. (and if you fancy one for your own bad self -- so we can be twinsies -- click through to buy one here). Trivia time: Did you know that while these days the word "loden" is used to denote a particular shade of darker-than-olive-but-lighter-than-mossy green (somewhere perhaps just a tad deeper in the woods than forest green), etymologically it's derived from a German word that means "thick woolen cloth." While at first glance it may not appear to be a very symbolic hat (compared to, say, a child's pirate hat, or a cap fashioned out of newspaper), make no mistake about it, when it comes to the hats I wear on a regular basis, pulling this one out of deep storage marks a seasonal switch. 'Tis no longer a high summer sun that beats down upon my brow, but a peculiar autumnal beast breathing down my neck, doing nothing to improve my mood -- beyond deepening my resolve to soldier forward. Day 120 / Hat 120: Child's size, black, plastic pirate hat with red contrast edging and Jolly Roger sticker on front. Interior tags read: "Amscan, Inc., Elmsford, NY 10523" and lists additional addresses in Canada and England as well as stating: "Made in China" (in English as well as French). Oddly, it also states -- in all uppercase letters: "THIS IS A TOY AND DOES NOT GIVE PROTECTION." Care to hazard a guess as to what time of year it is? 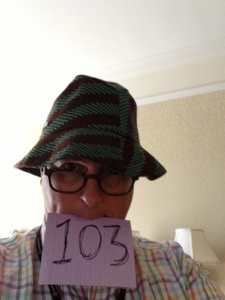 Day 119 / Hat 19: Green, 100% cotton, made-in-Italy, animal camouflage packable fedora by Ian Velardi. This is one of the Bride's gifts to me on my birthday and it was purchased at the recently opened Wittmore men's shop on nearby Third Street. Camouflage, as you may know (and the Bride certainly does) is one of the ubiquitous menswear trends these days. As an added bonus, you can see some of the Project's upcoming candidates laying in wait on the rack behind me in this photo. Obviously today's tip o' the hat goes to the Bride for sending me into my next year so on-trend. Day 118 / Hat 118: Black and yellow felt floppy top-hat-shaped rave-style lid with multiple smiley-face prints. Interior tag reads: "Made in Mexico, interior fabric made in the U.S.A" (which seems odd since there is no lining to differentiate the interior from the exterior). This hat was part of a birthday shipment of hats that arrived a few days ago from my sainted mother -- given the ambitious slate of headgear I have ahead of me it was the best gift I could have gotten. Unlike some of the other hats in the package, I know nothing about it. But I DO appreciate the very Seussian "Cat in the Hat" vibe of of it. It also reminds me to say -- in the immortal words of Mr. Roarke: "Smiles, everyone ... smiles!" And no, thanks for asking, but there isn't anything wrong with my glasses. It must be, wait for it ... an optical illusion. 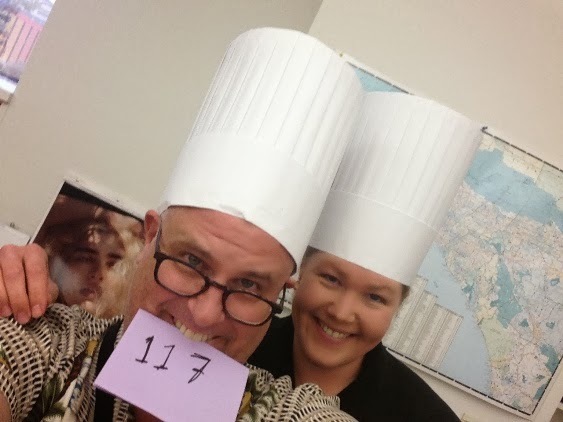 Day 117 / Hat 117: White, pleated-paper chef's toque blanche, with five-point star cutout on top and light green interior printing that reads: "Le Classic Cellucap." Courtesy of Noelle "Mad Hatter" Carter -- who appears with me in the above photo. You may remember her from the beloved NC series of hats (that's her at right with a few of the ones from previous installments of the Project). So what's the story behind the distinctive headgear? Carter shared the theories she'd heard and urged me to do a little exploring online. What I found pretty much jibes with her account. According to the folks at The Straight Dope there are a couple of theories, one involves an unfortunate hair in a royal soup (followed by a beheading), one that involves chefs in the seventh century A.D. taking refuge with, and adopting the garb of, clergy (this is the version Carter had heard) and one that makes it a symbolic crown (as royal chefs were in a unique position to poison the king, they were treated better than the average subject, the theory goes). "It was regarded as natural that any chef, worthy of the name, could cook an egg at least one hundred ways. The most-renowned chefs often boasted that they could serve their royal masters a different egg dish every day in the year, some of them so cleverly prepared, that aside from being highly palatable they had flavors as widely different as completely diverse kinds of foods. Today, noted chefs are seldom called upon to prove their prowess in this manner. Nevertheless, they still wear one hundred pleats on their hat, the old-time symbol of their skill in the egg department." Eggciting theory, methinks, even if completely apocryphal. So a tip 'o the toque and a crack of the egg to Noelle for whipping up this little bit of culinary couture. PC 116: Hey, Mr. Wheat! Day 116 / Hat 116: Child-size newspaper party hat folded from the front page of the August 18, 2013, edition of the Los Angeles Times, with purple index card and black Sharpie detail that reads: "Mr. Wheat, #116." Somewhere over the course of the last 100 hats, my brother Al (you may remember him from PC 84: Flowers in the Hair Edition) asked if the Project took special requests. "Well, like those hats you make out of newspaper," he said. "Sure, I suppose I could do that -- I'll put it on the list." Today seemed as good a day as any to keep my head in the game and honor my first special request. I found the instructions for this particular hat at a site called Skip to My Lou but there are versions scattered all over the interwebs. As for the "Mr. Wheat" designation? Ages ago after watching an SNL sketch in which Buckwheat from "The Little Rascals" (played by Eddie Murphy) gets shot, Al and I started reciting lines from it. Eventually the whole sketch was distilled down to "Hey Mr. Wheat!" On my mind literally and figuratively, today's tip o' the hat goes to the incomparable Mr. Wheat himself. As Buckwheat (or at least Eddie Murphy playing Buckwheat) might say: "I nub nou! I nub nou!" 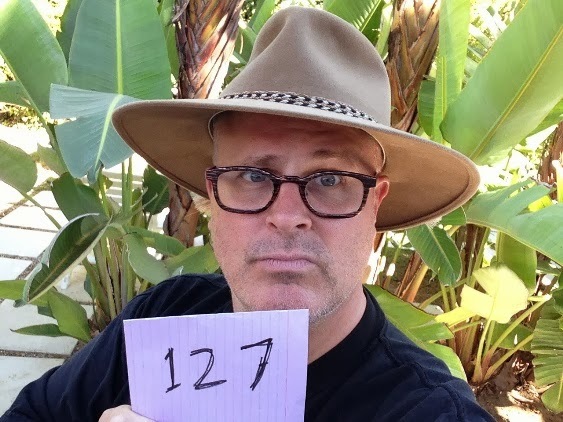 Day 115 / Hat 115: Gray Fedora with black, pleated silk hat band and button left side that reads: "FRINGE, the Final Season, Fridays 9/8c FOX." Jenn's not just a foodie, she's a FUNNY foodie. 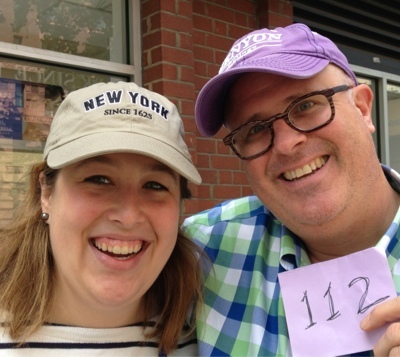 To see what I mean, check out Forkin' Amazing, the TV and radio smorgasbord of food talk she hosts with Dominic Riley that is one of the hats she wears when she's not slaving away on behalf of the paper. Note, as far as we know the job does not involve an actual piece of headgear -- but one can always hope. So, today's tip o' the hat in absentia goes to J "Cray" Harris wherever she roams. 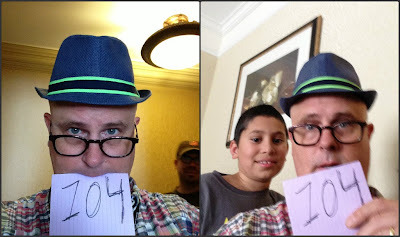 And yes, I realize my hastily drawn "115" looks a tiny little bit like "175." My apologies to haters of sloppy penmanship everywhere. gray embroidery on the back left. Interior tag reads: "The Classics, Yupoong, 80% acrylic, 20% wool, made in Vietnam." The second in the Project Cubbins freeway series from Sisters of Los Angeles, this lid pays homage to Angelenos' love/hate relationship with the freeway system. For those of you unfamiliar with our asphalt-covered ways out here, the 101 is also known as the "Hollywood Freeway," its southern end is at the Four Level Interchange in downtown L.A. and top the north it ends at the to the Golden State Freeway in the Sun Valley district of Los Angeles. The first section (downtown to the San Fernando Valley) opened in 1964 and the second (from that point to the I-5) in 1968, making the 101 the second-oldest Los Angeles freeway (behind the Arroyo Seco Parkway). Oh, and here's a fun fact: Its entire length falls within the boundaries of the City of Angels. You won't need a map to find your way to the fact that today's sincere tip o' the hat goes to the Sisters of Los Angeles. Day 113 / Hat 113: Brown, baseball-style cap with gold embroidery on front that reads: "I traded the best hat in the world for this one." 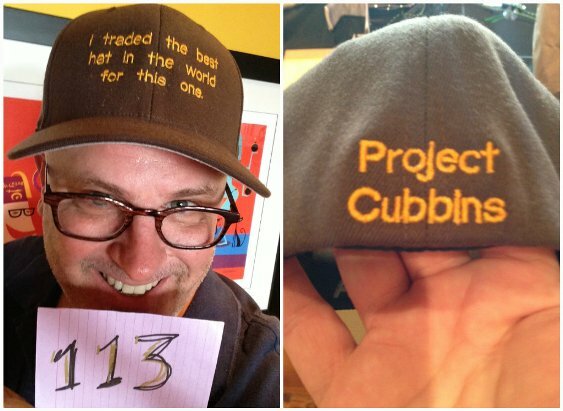 Gold embroidery on back (pictured at left in above photo) reads: "Project Cubbins." Interior tag reads: "Flexfit, 83% acrylic, 15% wool and 2% P.U. Spandex. By Yupoong, Made in Bangladesh." OK, I'll come right out with it -- this hat is a really, really special addition to the Project. I know I say that about a lot of hats, but there's a fun story behind it that is part of the magic that my quest has taken me on. This hat arrived in a package that was waiting for me when I returned from New York Fashion Week. The sender, a Mr. Bill Dunn from Seattle, Washington, (and until the launch of Project Cubbins, a complete stranger to me), had first contacted me back in July. "I stumbled upon your article where you mentioned a brown corduroy ball cap with 'Vermont '79' written on top of it. The reason I stumbled upon the article was because I am, in fact, looking for that same hat. You see, I am a guy who is extraordinarily particular about the hats I choose to wear. I don't have multiple hats. I have one hat, and one hat only. And I wear that one hat for more than a decade. In this case, it was the Vermont 79 hat. I am neither from Vermont nor born in 1979. The design on the hat wasn't what made the hat 'my hat.' It was the fit. There was something about that hat that just fit my brain cage perfectly. Every picture of me for the last 10 years includes that sweat-stained, dog-chewed, dishwasher-discolor we hat. It was my favorite. Everyone knew it. Every picture of me had that hat. People would know what I was wearing every day. Eventually, the elastic wore out and I had to put it down. 'Twas a sad day in my life. Literally. In the last few years, I've tried a couple other hats. A Seattle Seahawks hat and a Washington Huskies hat. They just don't cut the mustard. I have literally spent the last 3 years looking for that hat, and your article was the only mention I have ever found. In fact, as I write this, I am on a weekend getaway with my wife. I'm trying not to type too loud - I don't want my Seahawks to know that I'm trying to re-establish contact with an only flame - Vermont 79. Is there any possible chance that you still have that hat? If so, what would it take for you to let it go? I appreciate your time. And the article." Now, as you may know (even if you didn't before you read PC: 9) I did grow up in Vermont and was there in 1979 so I had formed a bit of an emotional attachment to the hat even though it was something the Bride had found at Old Navy years after I'd left the Green Mountain State. But Bill's e-mail was earnest and I told him if I couldn't track one down for him from the Old Navy folks I'd consider parting with mine -- but only in exchange for another hat I could wear for a future installement of Project Cubbins. It was a promise I started to have second thoughts about almost as soon as I'd hit "send." I remember him asking for my mailing address about a month ago and feeling a pit in my stomach as I sent my address. But when I opened the box from him last night and saw what he had sent in exchange, I immediately knew that "Vermont '79" would be going to a good home. A sincere tip o' the hat to Bill Dunn -- you are a man among men. And your hat? She's on her way. Take good care of her. 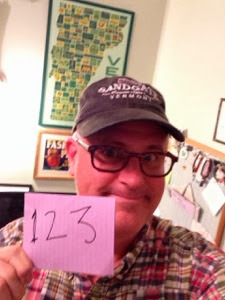 Day 112 / Hat 112: Purple, cotton, baseball-style cap with "Kenyon College" in white embroidery. 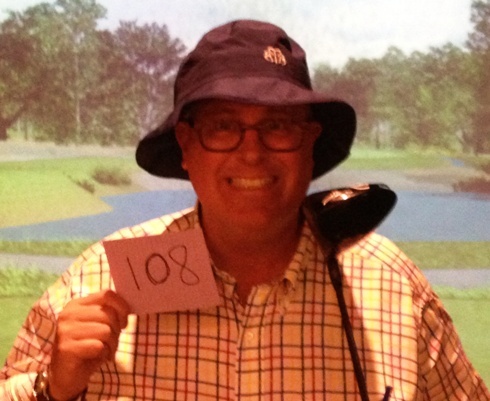 Courtesy of - and in honor of - my sister-in-law (with me in the photo above wearing the hat from PC 109). 'Thleen is an alumnae of Kenyon and today is her thirty-third birthday, which around these parts is known as one's "Jesus Birthday." So, today's tip o' the hat - and the happiest of birthdays to Kathleen. Day 111 / Hat 111: Child-sized, pink, cotton bucket hat with raw-edged brim and multiple whale-themed embroideries. Interior tag reads: "Kid Tees." Stealth-snapped in the gift shop of the American Museum of Natural History's "Whales: Giants of the Deep" exhibition earlier today. Make no bones about it, I would've krilled for a serious plush whale-tale hat -- purchased it in a New Amsterdam minute, you might say -- but there was no creature to be found. The photo on the left was me goofing around with a sign for the exhibition at the entrance to the museum. It was one of the many photos from today's visit with the Bride and 'Thleen (others included posing with a bronze statue of Teddy Roosevelt and a white-handed gibbon) that prompted the Bride to liken me to "a walking sight gag." this amphibi-lid on the fly this afternoon at E.A.T. Gifts at 1062 Madison Avenue. The Bride and I stopped by the store, which my mother would absolutely love ("It's elf-bag central," the Bride noted) while we were shopping our way from the Guggenheim Museum where we saw the James Turrell exhibition (now we're only a Houston exhibition and a Roden Crater away from filling out our Turrell punch card) over to the Metropolitan Museum of Art where I got a serious case of helmet envy while touring the Arms & Armor section. Day 108 / Hat 108: Navy blue waterproof bucket hat with stylized "BB" (for Brooks Brothers) logo on front, Gore-Tex logo on back and "Zero Restriction" on the inside lining. I spied this hat in the golfing section of the Brooks Brothers flagship at 346 Madison Avenue when I popped in earlier today to preview the brand's Spring 2014 collection. Not only did they allow me to use said hat for Project Cubbins, they let me grab a golf club and use their swanky golf simulator as a backdrop. Which means today's tip o' the hat obviously goes to the kind folks at Brooks Brothers. 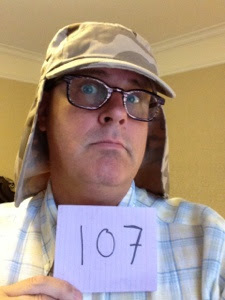 Day 107 / Hat 107: Desert-camouflage-colored hat with sun-protective flap in the back. Interior tag reads: "S.W. 65% polyester, 35% cotton, one size." I'll admit this was a "safety hat" I brought with me from L.A.. but it is wholly appropriate since camouflage is is so hot right now on the runways. And, it should be noted, I technically posted the photo on the fly last night - within the 24-hour window -- while consulting with an attorney (you know you're in good hands if counsel's nickname includes the word "Downtown") at the Campbell Apartment, and added a l'il more detail this morning. Day 106 / Hat 106: Driving cap in gray crosshatch pattern (exterior) and black and gray spot pattern (interior). Interior tags read: "Pamoa" and "Shell: 100% cotton, lining 100% cotton." As promised, this is the second of the hats -- and the one I actually purchased -- from Biswa Thapa whom I met yesterday (the first one can be seen here). PC 6: Where the Hell is Sandgate, Vermont? Day 105 / Hat 105: Handmade, multicolored felt hat with blue berry and green stem detail on crown, with white scalloped brim and pink felt hatband. Courtesy of Biswa Thapa and his Crystal Art and Craft Design Nepalese crafts and accessories store. I happened upon Biswa's business at 439 9th Ave. (between 37th and 38th Street) while enroute to the Band of Outsiders show today. After purchasing a hat (which you'll likely see sooner than later), I explained my quest to Biswa who offered to let me photograph myself -- and him -- for another installment, essentially turning the purchase into a twofer. How awesome is that? This fellow has some serious hats in stock, and I plan to keep him in mind if I find myself in another Manhattan "hatmergency." In the meantime, I tip today's hat to Biswa for his kindness -- he made me berry, berry happy. Day 104 / Hat 104: Blue woven straw fedora with black and green grosgrain ribbon detail. Interior tags read: "Made in China" and "The Children's Place." After complimenting him in his hat and properly introducing myself to his supervisory adult (whom I assume to be his mom) I explained my hat quest. Wouldn't you know it, the young lad, whose family was in town to participate in a cancer walk, was gracious enough to loan his lid to the cause. A sincere thanks and tip o' the hat to Robert (that's him in the photo at right) and his family. Day 103 / Hat 103: Green and brown knit Kangol hat from my personal hat collection and brought with as a "safety hat" - which I clearly needed since the hours have been ticking away. I thought about grabbing a bucket hat from Billy Reid's about-to-begin runway show since I was just backstage and could've easily overpowered one of the male models, but thought it unprofessional. And wouldn't you know it, the hat gods delivered. I found this awesome hat perched on the head of Decade's own Cameron Silver whom I spotted seated across from me at the David Hart menswear show earlier tonight. As we left the show, Silver introduced me to Rod Keenan, the Harlem-based hatter whose seriously stylish handiwork was featured in Hart's Spring Summer 2014 runway show. Keenan's the real deal -- first studying fashion in Paris at Parsons School of Design and later receiving a millinery degree (who knew there was a specific degree?) from the Fashion Institute of Technology. He produces two collections a year - straw lids for Spring and felted fur for Fall (say that three times fast!). When I breathless explained Project Cubbins to the nattily attired duo, Silver kindly doffed his cap for the cause (which, if my hat sleuthing is accurate, is the Tut style in Petrol from Keenan's Fall 2013 collection) and a wry smile crept across Keenan's face. "Oh, you should come visit me over in Harlem," Keenan said. "I've got some hats." Somehow I think that's the understatement of the year. A sincere tip of the hat to both gents for indulging my whimsical pursuits. Day 101 / Hat 101: White cotton canvas "Dixie cup" U.S. Navy style sailor's cap. Purchased on a recent trip to the Surplus Value Center. Judging by the fact that the store claims to sell "genuine government surplus" and the product number on the tag inside the hat (DLA100-84-C-0644 - which seems to be similar to the numbers found in other items from U.S. military uniforms) makes me think it is probably the real deal. I started poking around to find out more about these iconic hats (traditionally part of the enlisted sailor's summer uniform) and found myself going down a serious hat rabbit hole. Among the things I discovered before forcing myself to put the hat down and step away from the computer: they are (or at least were for many, many years) manufactured under contract for the U.S. government by Puerto Rico based Propper International, which churned out approximately 140,000 of them per month. "Seventy-five rows of stitching keep the brim of the dixie cup stiff. The brims are made on an automatic brim stitcher and the crown is put together on a sewing machine. When the two parts are completed they are stitched together using the sewing machine. The three-part operation takes about seven and a half minutes." According to the same site, which cites Marke A. Hensgen's "To Cap It All Off … A Fond Look at a Navy Trademark: Uses (and Abuses) of the 'Dixie Cup'" the U.S. Navy tried to phase out the hat with nicknames that include "squid lid," "Mason jar top" and "dog dish" for good back in 1973 but ultimately abandoned the effort. Day One Hundred / Hat One Hundred: It's a big day here at Project Cubbins HQ as I chart my one hundredth hat on the way to wearing 500 hats in 500 days. To mark the occasion, I've chosen a natty straw boater with be and red grosgrain ribbon detail. Interior tags read: "Genuine Panama hand woven in Ecuador," "Capas Headwear N.Y." and: "Meyer the Hatter" (the full contents of the latter tag can be seen in the above photo.) The ht is officially referred to at Meyer's site as the "Capas Panama Skimmer" and described this way: "The Panama Skimmer gives you the stylish Boater Style in a lighter Panama weight." I bought this hat over Memorial Day Weekend of 2012 during a trip to New Orleans for the wedding of our friends Tiffany and Wayne. The friendly fellow who assisted me in finding this fine-looking, perfectly me piece of headgear plucked from amidst the hatter's extensive floor-to-ceiling holdings was Chris Meyer, whose business card proudly reads: "5th generation hat man." red grosgrain ribbon detail (inside). Interior tag reads: "Anda & Masha." "Forever in search of the perfect hat, celebrity and fashion stylists Anda and Masha partnered up with Selima (best known for their chic eyewear) to create their own. Inspired by the edgy, bohemian whimsy of rockers from the '60s and '70s—and the fashionable birds who flocked backstage—each hat is crafted in a cellar-floor atelier hidden beneath Bond Street's cobblestones. We love this hat's feminine silhouette rendered in soft rabbit felt for a striking finish atop all this season's looks. Rabbit felt with cotton grosgrain and suede trim. Part of J.Crew Collection. Handmade in NYC." 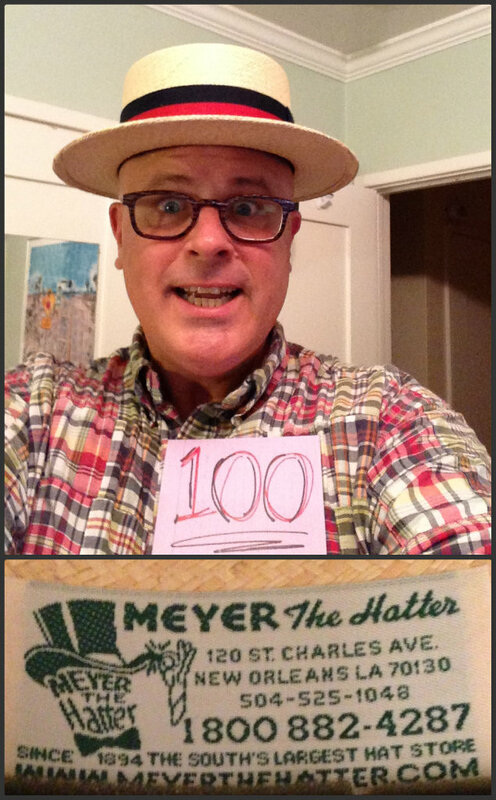 Just in case you've lost count, tomorrow marks hat number 100 and one-fifth of the way toward my goal of a hat a day for 500 days. Unless a random hat comes my way before then, the one I've got planned for first of the triple digits is a special lid indeed. Got hats? Send 'em. Hat requests? Let me know -- I love a challenge. The whale's name is Don Beuno and he's the "goodwhale ambassador" for the fledgling socially conscious brand co-founded by Don and Summer Meek. I first met Don back in my DNR days (I think it was during one of the crazy Surf Summit trips to Mexico) and our paths have crossed several times since then -- including at last summer's Launch LA trade show at Santa Monica Airport's Barker Hangar. The Soul Project, which team Meek describe as "an apparel company with a purpose" is their latest endeavor and you can read more about at the label's website. 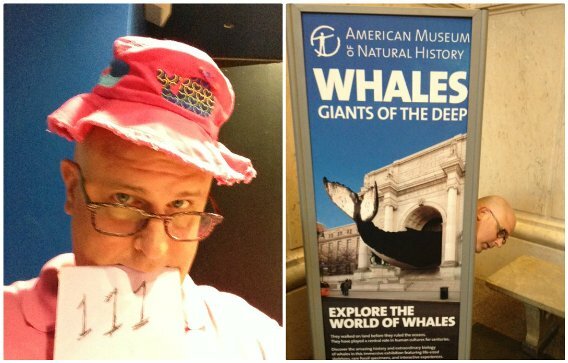 And if you want a whale of a hat -- like mine -- you can buy one here. Surf Summit: You Call This Work?